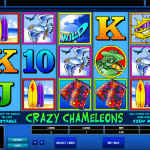 Crazy Chameleons is a video slot game from Microgaming that uses these reptiles as their main theme. You do not have to be a fan of these animals but you do have to admit they are super cool. They can adapt to anything and it seems that there is no end to their many talents. As we can see in this game, they can go to the beach and enjoy the waves just like you would. 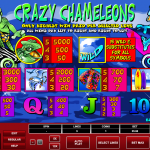 Crazy Chameleons is a 5 reels and 5 pay lines video slot game. This is an indicator that we have a very simple slot in front of us, and we all know what that means. There are no special features in this game. There are no free spins rounds or mini bonus games at all. We only have a wild which as in other games has a function to substitute for every other symbol to complete a winning line. The wild literally substitutes for every other symbol since there are no scatters or bonus symbols in this game. 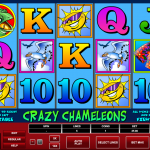 Crazy Chameleons is another game that complements the Microgaming portfolio of simple slots. This game is the perfect example that there are still punters who enjoy spinning the reels and hoping to land matching symbols. You would be surprised how many people like games like this one that offers simple and clean gaming experience. No distractions like complex special features that are difficult to trigger, no waiting for the third scatter, which you desperately need to activate a feature, which never shows. If you are in for an easy slot with hopes to win some cash we would advise you to try Crazy Chameleons since it is a game that is worth the try. For one of the nicer Christmas themed games consider playing Deck The Halls a 5 reel slot by MicroGaming.